Good Shepherd Center, which is on the National Historic Register, used to be a place of shelter and education for young women in need. After 60 years of such service, it was supposed to be turned into a shopping mall in 1975 until Wallingford neighborhood residents defeated that proposal. Thankfully, the nonprofit organization Historic Seattle took over management of this Seattle Landmark building, which now hosts a variety of community events. 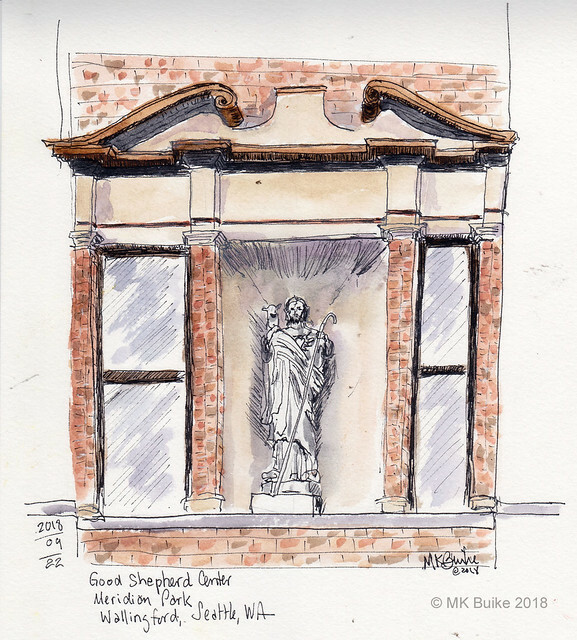 Originally owned by the Sisters of the Good Shepherd, it is a "Fine example of the Italianate style, embellished with Corinthian capitals and elaborate stone work. Built by architect C. Alfred Breitung in 1906. (per Tina K. and the website). 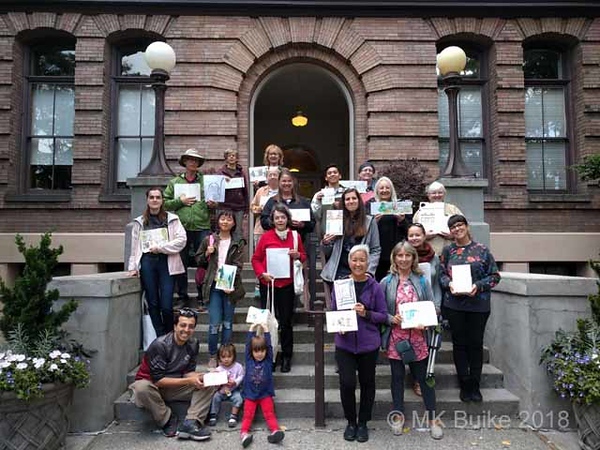 We held an unusual afternoon sketch outing yesterday after Michele Cooper's Urban Sketching workshop for Historic Seattle. There were about 20 sketchers and 2 or 3 new sketchers joined us. I wandered around the grounds. 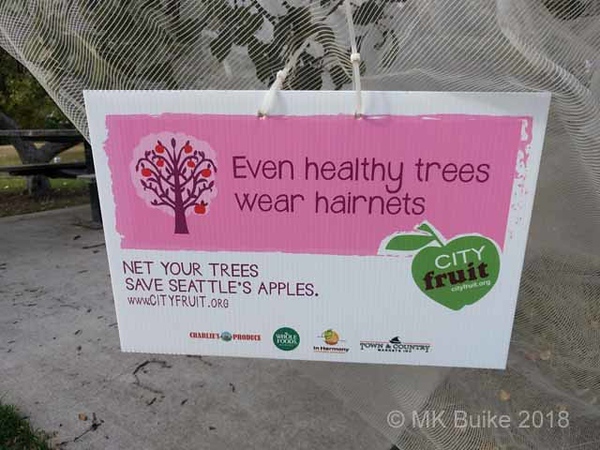 I'd not seen this before in Seattle but the trees were tented to protect the apples. They are having an heirloom apple tasting on October 17. 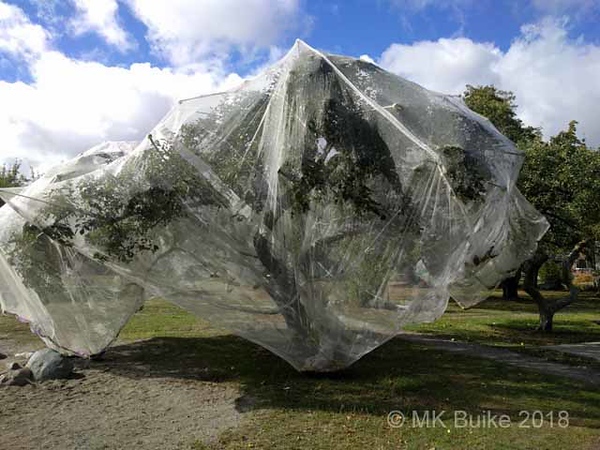 Apples have been grown there for 100 years. 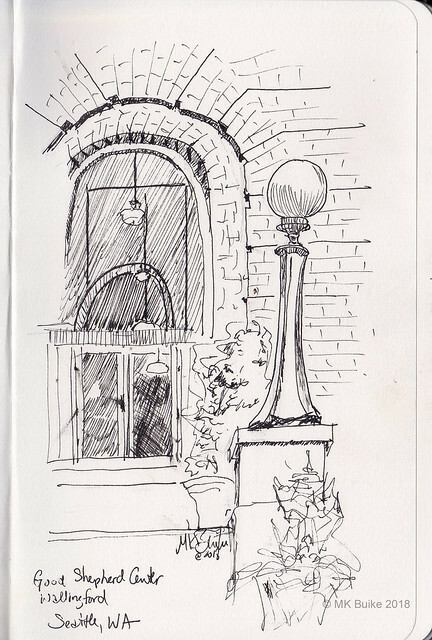 There were many sketch targets on the grounds but I settled back at the front entrance where I did two sketches. I'm continuing to practice for (or getting a head start on) Inktober. Loose sheet of "Fluid-100" 140# cold press watercolor paper; Platinum Carbon Black ink; Daniel Smith watercolors.